Ship Shape and Ready for Action. – Paper Never Refused Ink! Reproduced here with the kind permission of the Editor of An Cosantóir, this is my Article which featured in the July/August 2017 edition. The delivery of a professional service by the Navy with a high degree of certainty requires specific fleet standards, quality control and the monitoring of personnel and equipment in action. The standards necessary to operate the fleet, are the ‘bedrock’ of an effective service. Their importance is heightened when the ships taskings become more complex. It was deemed vital to establish an organic operational evaluation capability in order to meet the delivery of these requirements and to this end, in September of 2008, the Flag Officer Commanding Naval Service (FOCNS) directed the establishment of the NS Fleet Operational Readiness, Standards and Training (FORST) section within Naval Operations Command (NOC). The aim of FORST is to facilitate organisational learning and continuous improvement by highlighting best practice and the fleet standardised processes required for the generation, maintenance and evaluation of our operational capability (GMEOC). Within ‘House 50’ on Haulbowline, there is a small team of specialised staff who are subject matter experts. With these eleven personnel under the direction of Commander Ken Minehane, FORST achieves its mission by assisting ships’ Officers Commanding by providing guidance, sea training and assessment to generate and maintain the five pillars of operational capability. FORST is continually working to ensure that the base competency levels of Core Mariner Skills of Naval personnel serving at sea, which are inextricably linked to the operational capability, are maintained to a high level of proficiency at all times. 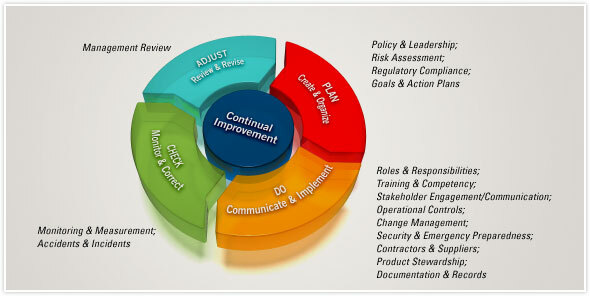 During the various training periods and evaluations these skills will be assessed externally by the FORST section. The Core Mariner Skills are broken down into the following categories: Bridge Management & Navigation, Seamanship and Ship Handling, Damage Control and Fire Fighting (DCFF), Communications and Fleetwork, Helo Operations, Above Water Warfare (AWW), Search and Rescue Procedures, Maritime Interdiction Operations (MIO) and Naval Boarding Procedures, Ships Protection Operations (SPO), Ships Organisation, Command and Control and Engineering Casualty Procedures. 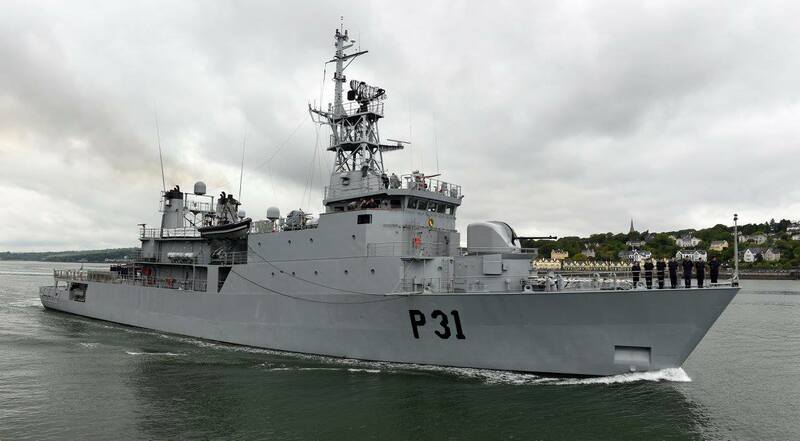 By using the external evaluation and sea training provided by the FORST section, the ships will be enabled to avail of objective internal and external confidence checks and ensure standardisation of operational capability, procedures and equipment across the fleet. In order to achieve all which has been laid out above, the FORST section co-ordinates the efforts of Operations, Support and Naval College Commands to ensure that a Plan/Do/Check/Adjust loop is completed, tailored to each individual ship. Plan: FORST plans the correct approach to achieve the op capability based on the requirements directed by the OCNOC and in liaison with Support & Naval College Commands. Do: FORST co-operates with Naval College & Support Commands to ensure a delivery of high quality service to the fleet that is constantly changing to meet current demands. Check: FORST checks the standards, equipment, personnel training competencies and op capability through assessment and sea training. Adjust: Having worked through the first three stages FORST will now, by advising of the necessary adjustments to training and support efforts through feedback from the fleet after assessment and sea training. FORST will also give feedback to Officer Commanding Naval Operations Command (OCNOC) on the fleet’s ability to implement policy. 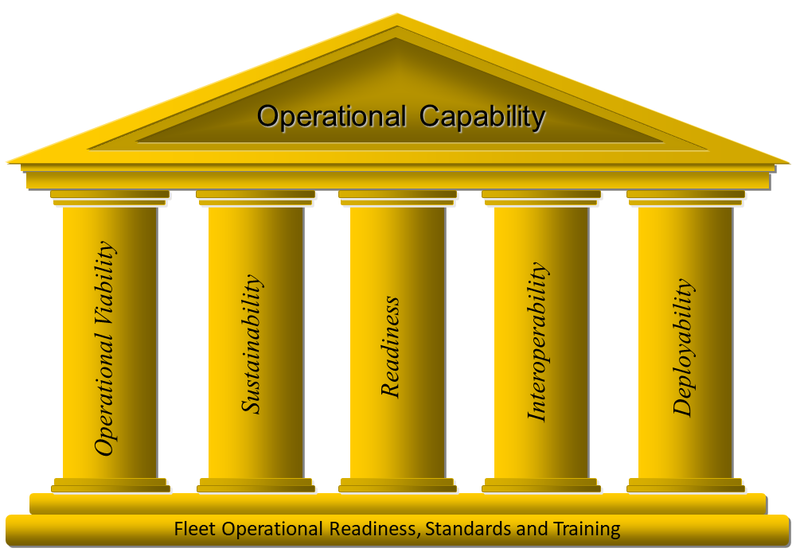 Operational Capability has five essential pillars. These are Operational Viability, Sustainability, Readiness, Interoperability and Deployability. A brief examination of each will give an overview of the complexity which is required in the military maritime environment. Operational Viability is ensuring the NS ship can prevail in an operational situation. It is achieved through the synthesis of personnel, equipment, military doctrine, organisation, training and command and communications. Sustainability is ensuring that capability continues and the NS ship can maintain a mission tasking, at the required operational tempo, for the duration required. Readiness is the immediate ability of the NS ship to execute a designated mission while balancing the constraints of time and capability. Many factors combine in this, current levels of personnel, training, equipment, command, control, communications and intelligence. Readiness must be underpinned by appropriate doctrine and should be continually shaped by lessons learned. Interoperability is concerned with ensuring that NS ships can operate ‘jointly’ and successfully with other force elements or ‘combined’ with other military organisations or civilian authorities. It entails familiarity with other operational procedures. Consequently, this requires suitable equipment, personnel, systems and infrastructural programmes, policies and procedures. Deployability is concerned with ensuring that an NS ship can deploy to a mission area in a given time frame. It entails raising force elements to deploy nationally and/or internationally with the required training, preparation and equipment in place. 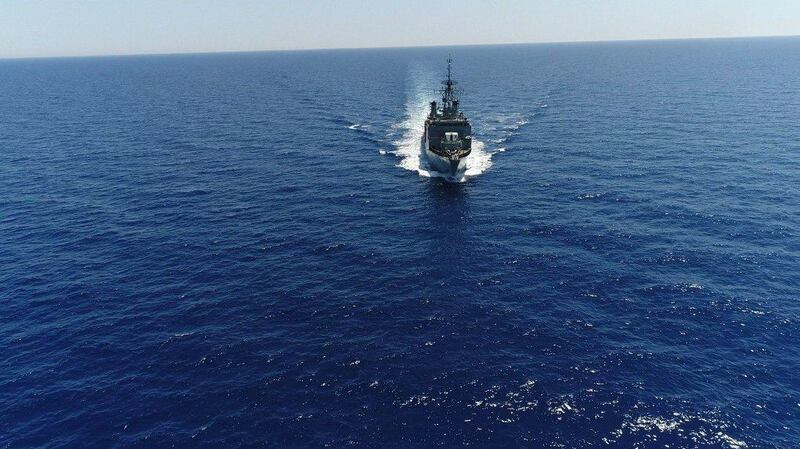 The current pinnacle of seeing the Five Pillars in action are the ‘OP PONTUS’ humanitarian missions currently underway in the southern Mediterranean off the Libyan coast. A FORST team is embarked for the first seven or eight days of these missions as our ships steam South. They conduct a Mission Readiness Evaluation and Training (MRET) period onboard over this week which is short but intense; on completion of the MRET the ship will be at full operational capability, ready to meet whatever challenges exist in the area of operations (AO). Each MRET is tailored to the specific mission to which the ship is assigned at home or abroad. The MRET conducted on an OP PONTUS bound vessel starts by having the basics reconfirmed; response to emergencies such a Fire or Collision, then Ships Protection Operations from small arms to main armament which are tested, drilled and fired. 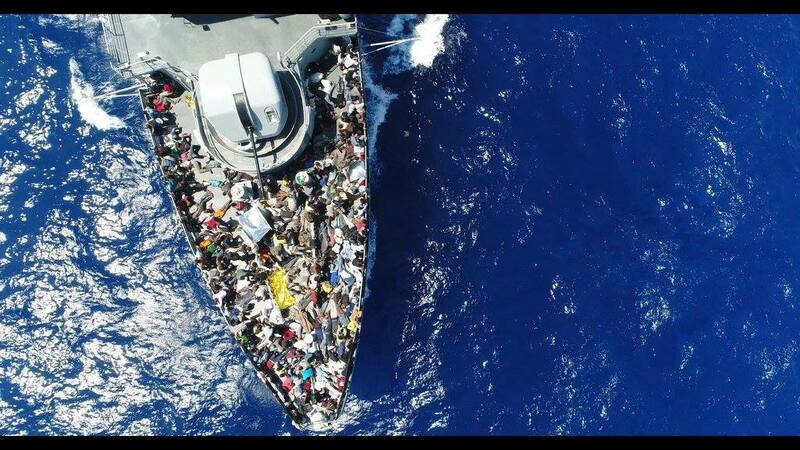 As these competencies are being confirmed the ship’s company are still working each day to adapt these patrol vessels for the mission by the temporary addition to the ships superstructure of items such as washing facilities, sun-shelters and shuttering around medical treatment areas. Then there is mission specific training delivered by instructors with direct mission experience such as SCPO/SEA Philip O’Connell, CPO/ERA Ruairí de Barra and PO/HA Declan Tighe on a wide range of subjects such as Migrant Handling and the use of Personal Protective Equipment, Searching Techniques and Intelligence Gathering, Gender and Cultural awareness, Emergency First Aid and CPR. All the training culminates in full ship’s drills where rescues are simulated, each individual becomes familiar with their role and the location of each item of equipment is tested, checked and rechecked. 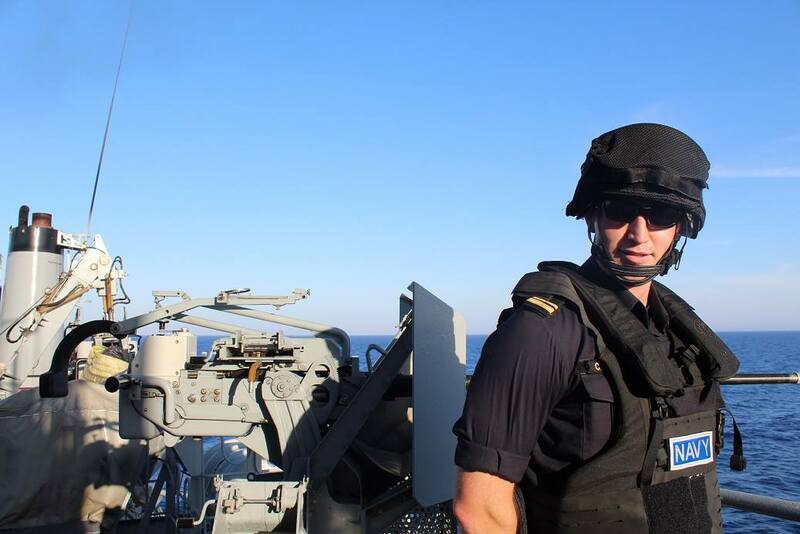 The next time these suits will be worn, these RHIBs launched, these guns uncovered and that body armour strapped on will be for real; when the ship is fully operational perhaps at night with the lights of Tripoli glowing over the horizon and a migrant craft in distress to leeward with 150 persons crammed onboard. There, the balance between life and death is at close quarters. All the training and experience and the resolve of the crew is required to complete the mission without fear or failure. ‘There can be little doubt in my mind that a MRET period add to and assists in the success of a mission. This is a concept that is NOT entirely new in the NS, it is a vital and key enabler to mission success that we have been carrying out for a number of years. The MRET is in fact only part of the third phase of a multiphase format followed by the unit as they prepare for overseas deployment’ Lt (NS) Cotter explains. As the FORST team made ready to depart LÉ EITHNE, the crew of the flagship of NS gathered on the flight deck in the bright Sicilian sunshine. Fell in, in three ranks the OC thanked them and the FORST team for their work. He spoke with great honesty about the challenges that they would face in the weeks ahead. He spoke of his pride in the crew and reminded them that their home, this warship beneath their feet, was the first vessel undertake a mission in 2015, he assured them that they would not just follow in that wake but lead. He also made reference to the proud history in which they would play their part, a tradition of peacekeeping and international humanitarian efforts stretching back many decades; that the tricolour on their shoulder and its companion flying off the stern marked them as part of an Irish team who would face the mission to come in the finest traditions of the service. Surface Assets: Rigid Hulled Inflatable Boats with inboard diesel engines. The workhorses of any ship. Sub Surface Assets: LÉ EITHNE has a Naval Diving Team onboard. NS Divers also have another ‘normal’ day role. 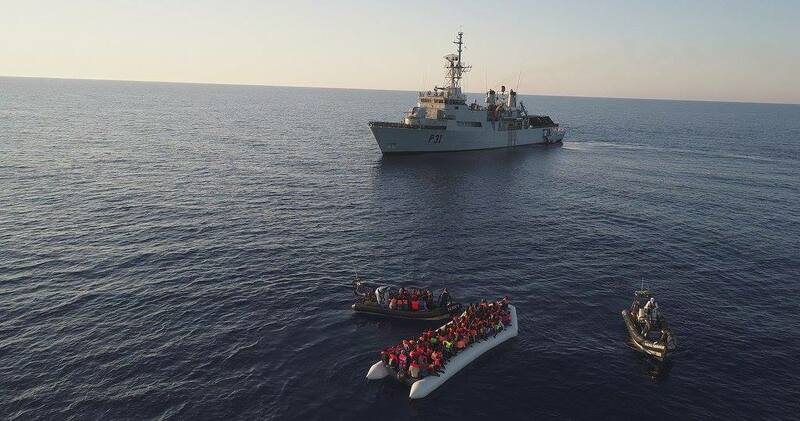 Aerial Assets: LÉ EITHNE is the first ship to deploy a drone onboard for aerial surveillance during migrant recovery operations. While diving it is used to provide a look out for threats to the team while sub-surface.